CON ESTA NUEVA EDICION NO SOLO TENDRAS UN NUEVO LIBRO DE RECETAS DE CUCHARA SINO QUE TAMBIEN TENDRAS LA BOLSA DE TRANSPORTE Y UNA BOLSA TERMICA,CON LA QUE PODRAS LLEVAR TU COMIDA A LA PLAYA O AL CAMPO. 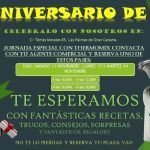 Y LO MEJOR DE TODO ES QUE LA PODRAS ADQUIRIR DESDE COMODAS MENSUALIDADES AL MES.PONTE EN CONTACTO CONMIGO Y TE INFORMARE. 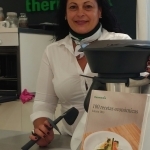 ESTA FANTASTICA EDICION ESTA COMPUESTA POR EL Thermomix® 5,ULTIMA GENERACION,BOLSA DE TRANSPORTE,BOLSA TERMICA Y 2 LIBROS EN PAPEL Y DIGITAL.CON Thermomix® , TU VIDA SIEMPRE A MAS.